Meet & greet Croteam at GDC & PAX East! Good news everybody! We’ll be attending this year’s GDC in San Francisco, where Talos Principle will be featured at IGF pavilion in Expo hall as one of the IGF finalists. As you probably know, we were nominated for 3 IGF awards – Seamus McNally Grand Prize, Excellence in Design and Audience Award – and we’d like to thank jury for this nice recognition of our hard work. See you soon, and thanks for your support! Broforce – 10 Steam keys for our community bros!!! Team up with up to 4 bros and save the world, because freedom is not a joke! Enjoy humor, over-the-top action and CoOp with other bros.
We will award 10 Steam keys for this thrilling game to some of you when our Steam community grows to 100.000 members. As always, if you want you can help spread the news about The Talos Principle by inviting your friends to The Talos Principle official Steam group and together with them enjoy rewards that we prepared in our giveaway! Dear fans of The Talos Principle, as you might already know, The Talos Principle was nominated by Independent Games Festival (IGF) for Excellence In Design and Seamus McNally Grand Prize, and has honorable mention for Excellence In Narrative. IGF awards are the most prestigious indie game awards where panel of judges, all industry experts, decides who will win prizes. 1) Choose The Talos Principle from drop down menu. Thanks for joining our evergrowing Steam community, we now passed 81.000 members! Our way to say thanks is to announce surprise game that we will be giving to some of the lucky members. That is one old school shooter done properly on so many levels. And no game executed first person melee combat as good as Shadow Warrior did with mythical katana. Just wielding it through opposing flesh makes this game worth playing. But there is so much more, humor, upgradeable weapons and unmistakeable old school gameplay. Just try it out! We will award 10 Steam keys for this thrilling game to some of you when our Steam community grows to 100.000 members. So join our community, help us grow and enjoy rewards! 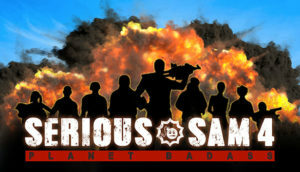 To make this deal sweeter, we will give you 200 keys for various Serious Sam games! It’s a heaven for old school shooter fans! As always, please help spread the news about The Talos Principle by inviting your friends to The Talos Principle official Steam group and together with them enjoy rewards that we prepared in our giveaway during the coming weeks.